Since rich media is increasingly being used by B2B buyers to inform their purchasing decisions, marketers are embracing rich media assets to drive demand for their products and services. In this webcast, James Miller from BrightTALK will interview Michelle Megarry, Global Marketing and Brand Manager at Intel. We will discuss what the most effective rich media assets used by B2B marketers are and how these assets help organizations grow their awareness, educate customers and prospects as well as generate qualified leads. In this webinar, you’ll learn how to align sales and marketing by creating a demand funnel that provides the taxonomy, process, and metrics for effective demand generation. David Lewis is a dynamic speaker, metrics-based marketer, and successful "Inc. 500" entrepreneur. As founder and CEO of DemandGen International, his team educates and works with sales and marketing teams on effective lead management, online marketing, marketing automation, and CRM systems. His speaking style is humorous and energetic; he keeps his audience continually engaged through interaction, sharing stories, and relating experiences. With 20+ years of sales and marketing experience, David and has team have helped 100's of the top sales and marketing teams improve their demand generation and customer acquisition programs. His extensive experience will provide you great insight into the challenges and opportunities of the sales/marketing relationship -- which is at the heart of every closed sale. Your potential customers are online right now learning about your products and services. How are you helping them in their buying journey from research to selection? The art and science of staying in front of buyers as they’re considering your product or service is called Lead Nurturing. Lead Nurturing brings a fundamental shift from how marketing and sales operate, by removing much of the qualification work that sales does and focusing them on closing. Today’s panel represent the expanding vanguard of marketers who have rolled up their sleeves and are making Lead Nurturing work in EMEA. John Watton, Head of Global Marketing at Expedia Affiliate Network (Expedia). John is one of Europe’s Marketing Automation pioneers. He first implemented Marketing Automation at Shipserv in 2008. The results were truly impressive and John was named B2B Marketer of the Year in 2009. Teri O’Neal is Marketing Automation Manager EMEA at NetApp. She is responsible for integrating marketing automation into EMEA demand generation strategies. Stan Woods, Managing Director at Velocity, a B2B Marketing Agency specializing in technology. Authors of the B2B Marketing Manifesto Velocity work with companies to generate great content – the fuel that drives marketing automation platforms. John Sweeney (Host), Customer Success Director, DemandGen. DemandGen are Marketing Automation consultancy and help companies deploy Marketing Automation globally. Listen in on how Frost & Sullivan is using seProposals to increase sales, and then learn some tips and tricks for improving your proposal and quoting process. Paul Burgo of Frost & Sullivan will share how he was able to implement a new process for his world-wide sales team to clarify complex offerings across a wide range of research and consulting services. Immediately following, Amit Davé, president of salesElement, will review some proposal best practices and share 10 tips on creating great proposals and accurate quotes. Paid search isn't the same in B2B as it is for consumers. It's not about click-to-conversion, shopping carts, and instant gratification. But paid search can fit into your B2B sale. In this webcast, B2B paid search expert Jim McKinley of 360Partners explains some of the key challenges and how to overcome them in building a BtoB search campaign. 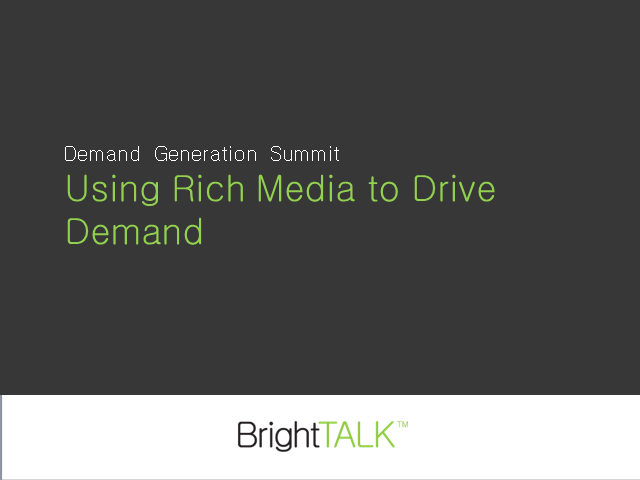 Content is one of the foundational pillars of a successful demand generation program. Companies can develop solid marketing plans and invest in leading technology to support demand generation, but they cannot achieve their goals without a strategy in place to deliver valuable, relevant content. •Content: how much is too much? Playbooks are a key part of sales enablement. They make all the difference in the Sales team’s ability to run with the ball and close the deal after Marketing hands off a qualified lead. This presentation will review key steps to building playbooks that ensure Marketing is setting up Sales for success. Your CMO has a scorecard: It’s the amount of revenue marketing generates, and the amount spent to do so. If you’re thinking click-throughs and top-of-funnel leads only, you’re not helping your CMO make a strong case for your team (or for yourself). This presentation will explain how to match your efforts with the metrics that matter to your marketing leadership. You’ve probably heard of the term Lead Nurturing before, but what does that really look like in practice and how difficult is it to setup? In the session, Jeff Yee from Dun & Bradstreet will share approaches that he used to gain quick wins with lead nurturing to drive a measurable lift in new business. Approaches will include – arriving at your definition of lead nurturing, identifying the fastest path to getting in field, maximizing your adoption rate and instantly converting the interest you receive into productive sales activity. Join Demand Generation Consortium members as they present sales and marketing best practices through case studies, roundtables and best practice analysis.